This look is one of my favorites of the year. 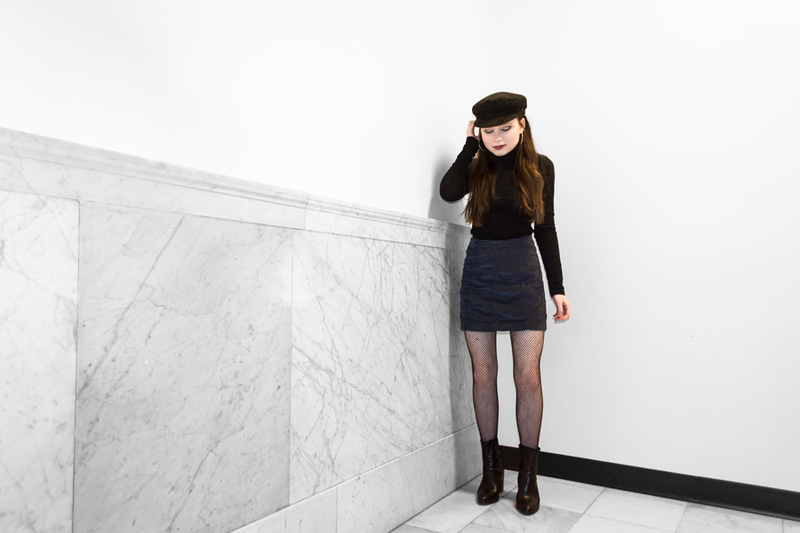 It combines a few of my favorite fashion things: the color black, the color blue, my Greek fisherman hat, my Rebecca Minkoff mini bag, sock boots, fishnets, and big hoop earrings. It's the perfect outfit for a warmer winter day, which we've been having far too many of lately in New England. (Global warming, anyone?) Warm winter days should be an oxymoron, but I digress. What I love most about this outfit is all the texture mixing happening. This Free People blue corduroy skirt is a unique piece with a cozy, luxe vibe. Corduroy has been everywhere this season. It reminds me of my childhood and, of course, the bear. I paired the skirt with fishnets to add pattern, interest, and edge. Sock boots are the finishing touch. I went with a simple black turtleneck to keep it posh. I would say I wear turtlenecks too much, but there's no such thing! A fisherman hat caps off the look.